With the large Filipino population in the GVRD, it is somewhat surprising that there are so few Filipino restaurants. I posed this question to Rich Guy and Rich Gal (she is from the Philippines) in hopes of finding an answer. The explanation went like this: since Filipino food can be cooked at home, more often than not, people won't spend the money to go out to eat. With that kind of thinking, I guess it was no surprise that Rekados didn't stand a chance, especially at their price points. Well, that is all fine and dandy, but that really puts a damper into my curiousity about Filipino cuisine. Rich Guy merely laughs at that fact since he is not a huge fan of Filipino food. What the heck did he eat while he was living there then??? 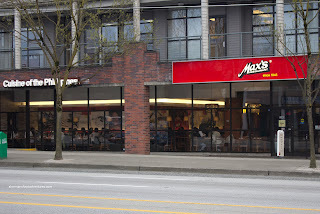 Despite this, he did tip me off about Max's Restaurant (a popular chain restaurant in the Philippines), which has opened their 2nd Canadian location on Kingsway in Vancouver (the other one is in Toronto). Originally, we wanted to check the place out during its soft opening, but with lineups 20 parties deep, that was quickly quashed. However, with softball being cancelled due to rain, I was left without a game and food for a Monday. Not to fear though, Bear and Milhouse still wanted to go for eats, which led us to Max's. 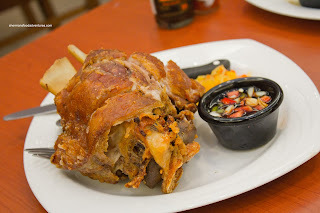 The first thing that caught my eye was the Crispy Pata. For those who are unfamiliar, it is a deep fried pork knuckle served with soy-vinegar dip. We only went for the mid-size which was still quite substantial. It could've have been crispier, yet it was still plenty crispy. We were pleased with the ample amount of moist meat underneath. 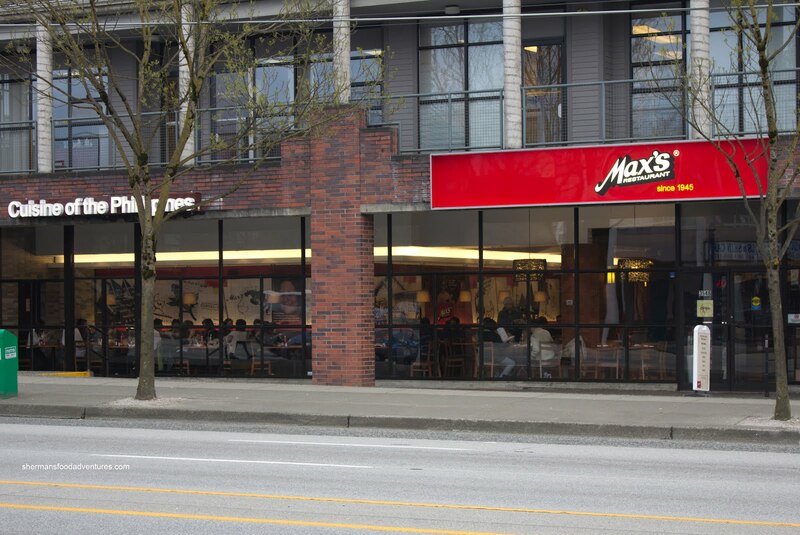 Now a visit to Max's would not be complete without their famous Fried Chicken. Somewhat similar to Chinese fried crispy chicken, their chicken is fried without batter. Hence, the fat is rendered in the frying process leaving a crispy, flavourful skin. 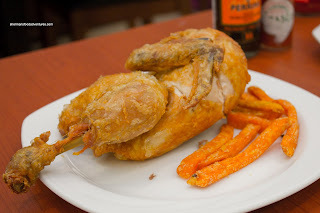 The chicken was mostly dry and only certain parts of the skin was crispy. It had a subtle flavour which we didn't mind. It was alright for what it was, although it was not very big. For me, I like the simple things and the Pancit Bihon would be one of them. 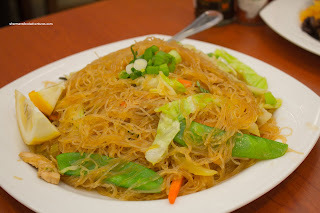 It is simply a dish consisting of rice noodles stir-fried with veggies and meat (chicken, pork and shrimp in this case) with soy (this one had fish sauce as well). The noodles were cooked nicely exhibiting some chew while the veggies were still crisp. From the first bite, it was obvious that there was fish sauce. There was no absence of flavour and for me at least, there seemed to be a good amount of MSG. 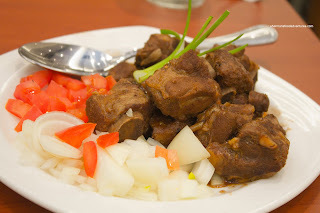 By virtue of being considered a national dish, we had to order the Pork Adobo just because. In reality, there is nothing really all that special about the dish because it is merely pork stewed in vinegar, garlic, soy sauce and a few other ingredients. For some, they love it and for others, it's "meh". I fall into the "I don't mind" category. The one we had was actually not bad. I loved how they used rib meat where it retained a slight chew while being mostly tender. The flavour was pretty mild with only a small hit of vinegar. 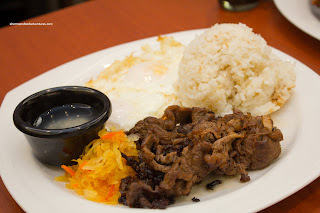 Lastly, we decided to try one breakfast dish being the Tapsilog. I've had tocilog before and this was pretty much the same except for the meat. This one was beef rather than pork. As with any silog, it includes fried egg and garlic rice. We found the meat to be rather dry, yet flavourful. The egg was fried beautifully with a runny yolk while the garlic rice was a big clumpy and not that garlicky. We found the service to be quite good despite all the poor reviews. In terms of the food, it wasn't bad. On the other hand, it wasn't exactly super impressive either.